Map maker : BERTIUS, P.. Size : 5.6 x 7.6 inches. / 14.2 x 19.2 cm. 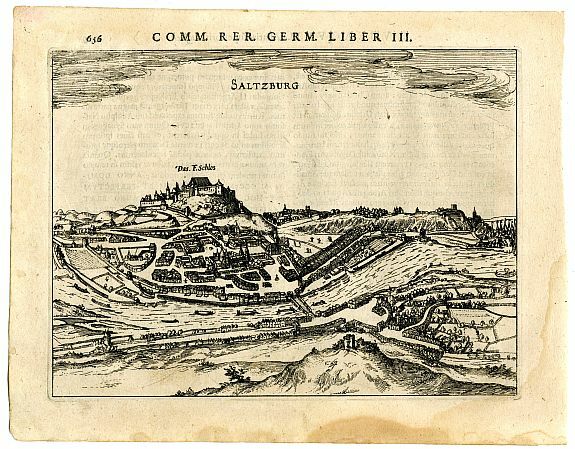 Description :Important birds-eye view of Salzburg in Austria, the birthplace of Mozart. The view shows the city with the river, castle, and many single buildings. Lovely illustrated and very detailed. With Latin text on verso. Rare and decorative view, published in Bertius "Commentariorum rerum Germanicarum" after Braun & Hogenberg. Condition : Good dark impression. Paper toned, slightly soiled and dampstained to margins. One tiny pinhole to top borderline. Faint showthrough of text from verso.